There is something about Bluegrass, and by extension, Bluegrass-Gospel, that has always appealed to me. This style of music utilizes timing formats that, in other music genres, would be considered unacceptable. Bluegrass artists often take a line, in a song, and they will extend it on into the next bar. Until you get used to this, you can't help but think that there is something wrong with their time tracking. If you listen carefully, however, you will find that the beats per measure are still correct. This anomaly serves to add an element of excitement to the music and allows the listener time to fully understand what the lyrics are saying. In so many formats of music these days the words are rattled past you so fast that you can't quite make out the meaning of the song. I think it is nice that there are folks who write music that you can enjoy the sound of while appreciating the message within the lyrics at the same time. 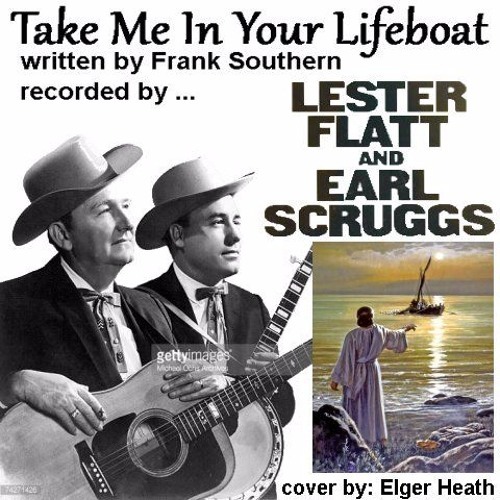 Frank Southern's gospel number, 'Take Me In Your Lifeboat', is a perfect example of exactly what I am talking about. It is simple and yet powerful in it's message and yet without that extension of lines into the next measure much of the charm of this song would be lost. Lester Flatt and Earl Scruggs are among the first music artists, that I know of, to record this tune. My version is somewhat slower, than most. This is how I remember it being done when I heard it, although I can't for the life of me recall who I got this version from. This is the great thing about being able to play music. You can do a song the way that you feel it should be done rather than the way it is served up to you by some recording studio in Nashville. Here is my cover of an old, and somewhat rare, gospel piece called 'Take Me In Your Lifeboat'.